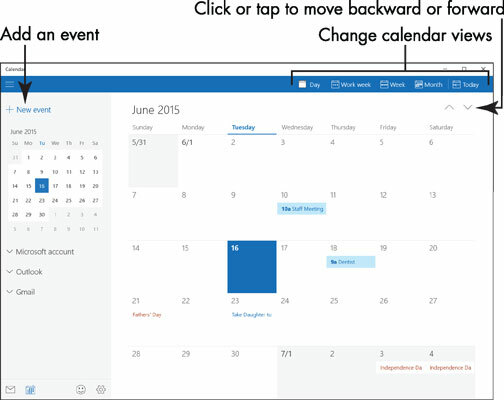 You can use the Calendar app in Windows 10 to keep track of birthdays, anniversaries, appointments, and other events. 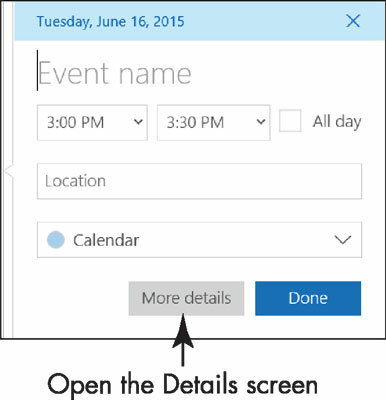 To see the calendar and add events, open the Calendar app from the Start screen. 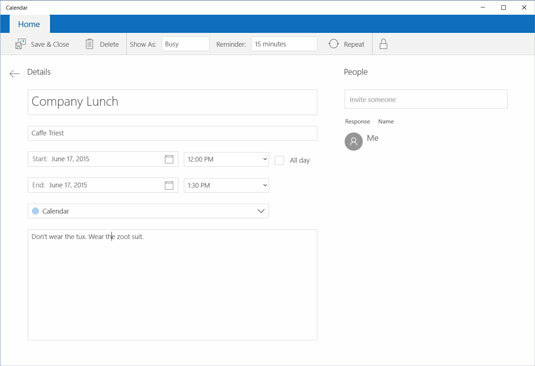 You may see events and appointments from services you connected to in the People or Mail apps. Day: This format displays a single day with a box for each hour. Select arrows near the top of the screen to scroll back or forward one day at a time. Scroll up and down to see more hours in the day. Work Week: The current work week (Monday through Friday) appears. As with the Day format, scroll up and down to see different hours and use the arrows to move forward or back a week at a time. Week: The current week appears. Scroll or use the arrows to go from hour to hour or week to week. Month: The current month appears in the classic month layout. (Depending on the size of your screen, you may have to scroll to see this format.) Today is highlighted with a different color. Use arrows near the top to move forward and back a month at a time. Select the Today button on the Calendar app bar to go immediately to today’s date on the Calendar. Short but cursory: Click or tap the day on which the event is to occur (in the Month format) or the hour and date on which it is to occur (in the Day or Week formats). You see the pop-up window shown here. With luck, this little window is all you need to describe the event. Type the event’s name, and if it isn’t an all-day event, deselect the All Day check box (if necessary) and use the start time and end time menus to describe when the event starts and ends. You can also type the event’s location. Select the Done button when you finish describing the event (or select the More Details button to open the Details screen). Slow but thorough: Select the New Event button. The Details screen appears, as shown. Move on to the next step. Event Name: Describe the event in one to three words. The description you enter will appear on your calendar. Location: If listing the location will help you get to the event on time, by all means list it. The location, like the event name, appears on the calendar. Start and End: Select the calendar icon, and on the pop-up menu that appears, choose the day on which the event begins and then the day on which it ends. Hours/All Day: If this isn’t an all-day event, deselect the All Day check box, if necessary. Then use the drop-down menus to describe when the event will occur. If the event is one that recurs, you can schedule it on a weekly, monthly, or yearly basis on the calendar. Weekly staff meetings, birthdays, and anniversaries are examples of recurring events. Select the Repeat button on the app bar along the top of the screen to schedule a recurring event. Then, using the Repeat options that appear in the Details screen, describe how often the event occurs, when it occurs, and when it will cease occurring. Event Description: Describe the event in detail if you think it’s necessary. Should you wear the tux or zoot suit? The ball gown or the formal dress? This is the place to record your thoughts on the matter. Show As: Choose an option on this menu if you share your calendar with someone, such as a receptionist, who may schedule you for other events. You can declare yourself free, tentative, busy, or out of the office. Reminder: How far in advance of the event do you want Calendar to display a notification? Choose None, 5 Minutes, 15 Minutes, 30 Minutes, 1 Hour, 1 12 Hours, 1 Day, or 1 Week. Private: Select this option to prevent this event from appearing on a shared or public calendar. The event remains visible on your own screen. On the calendar, your event appears on the specified date and time. To edit an event, select it on the calendar. The Details screen opens. Add or change any detail. To delete an event, open it in the Details screen and select the Delete button select the Delete button (a trash can). If your Microsoft Account is connected to a third-party service such as Gmail, events from that service appear on your calendar. Display the Settings panel and select Accounts. You see a list of accounts. Select the account, and in the Account Settings screen, select Change Mailbox Sync Settings. Then, on the Sync Settings screen, choose whether to sync the calendar on the third-party service with the calendar you see on the Calendar screen.